ErgonoptiX Comfort – Dental & Surgical Loupe Guide – Which model loupe do I need ? When purchasing new loupes, it is important that you choose the correct magnification and working distance in order to ensure that you work in complete ergonomic harmony, and your new loupe compliments your personal needs. Assuming the correct working posture reduces eye strain, back / shoulder / neck tension, and the related stress-induced headaches. Less known but no less important is the psychological impact: good ergonomics and comfort during work, improve your information processing speed and decision-making proccess. 2. Magnification – What level of magnification should I choose? 3. Working Distance – What is my working distance? 4. Mount (Connection) Type – What kind of mount or frames do you need / want? 5. Frame Type & Size – What type and size frame do I need? 6. Field of view – What about field of view? 7. Depth of field (Depth of focus) – What about depth of field? 8. Prescription Lenses (Corrective Lenses) – What if I need prescription lenses? 9. Weight Of The Loupes – What about the weight of the loupes? Which loupe type fits your needs, your personal preference, and your budget? 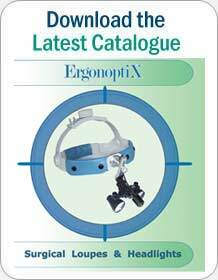 The different ErgonoptiX Loupes types and models all have their advantages. – The “regular” size flip-up loupes. – Easy to adjust and share with other users. – The price is lower than the other types of loupes. – micro size Flip-Up loupes. – The price is the mid-range. – Provide a personalized fitting. – Light weight loupes made for your specific personal attributes. The level of magnification used is most often based on personal preferences. However, there are a few guidelines which could help in choosing the best magnification for your specific needs. Our first recommendation is to choose the lowest comfortable magnification level, as this would provide the widest field of view. The working distance refers to the distance between your eyes, and the area you are working on. You can measure this while assuming your normal working position, making sure you are comfortable, that your back is straight, and that you are not leaning forward (or backwards) too much. Perhaps you could ask someone to assist you in this procedure. – Loupes on Frames: A wide variety of frames types and colors are available. – Loupes on Clip-On: Easy to use, not as stable for professional medical use. – Loupes on a Headband: The choice of surgeons, best for long work days. Available in “one size fits all”, but there are some smaller, and some larger models. The most important dimension for determining frame size is A – The temple distance. Find a pair of glasses that fit you comfortably (your own, others, sunglasses?) and measure the temple distance along the inside of the frame. (Preferably use a similar style, straight frame). Compare those measurements to the ErgonoptiX frames (see chart bellow) and choose the frame size that is closest to your own measurements. The field of view is the area that is visible & in focus, while looking through the loupes. A larger field of view is nearly always preferred, as there is a larger area visible through the loupes, and there is less need to move your head around. The size of the field of view often changes with different working distance and magnification. Simply stated: Loupes with a longer working distance will have a larger field of view. With ErgonoptiX micro Galilean and micro TTL loupes this difference is minimal. ErgonoptiX Loupes provide a large field of view (up to 125mm wide and 200mm deep). The “depth of field” is the depth of the area that is visible & in focus, while looking through the loupes. A higher depth of field is preferred, as there is a deeper area visible through the loupes, making it easier to work without loosing focus as you move your head. All ErgonoptiX Comfort Loupes utilize high performance lens systems that provide an extra large depth of field (up to 200mm / 7.8 inch). If you use glasses with prescription lenses, it is important that you have the option of fitting your loupes frames with the correct prescription. Otherwise, the loupes will not perform according to specifications. 1. Metal Spectacle Frames The ErgonoptiX Comfort, metal spectacle frames, can easily be fitted with prescription lenses by your optician. 2. Safety Frames Developed especially for the ErgonoptiX Flex and Active Safety frames, the RX-X and the RX-A prescription inserts allows you to use the Flex or Active Safety Frames with your personal prescription lenses. The special inserts can easily be fitted by your local optician. 3. Head-Band ErgonoptiX Comfort loupes are also available in a “Head-Band” option, allowing you to use the loupes in combination with your regular glasses. 4. Clip-On ErgonoptiX Comfort loupes are also available in a “clip-on” option, which can be clipped on to your regular glasses. Weight is an important factor when choosing a new loupe. Especially if the loupe is to be used for longer periods of time. 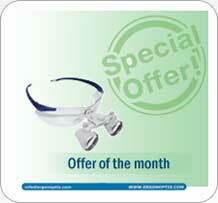 Light weight loupes are more comfortable, and in the long term, will reduce tension and strain. Ultra light weight loupes, offer the maximal comfort. All ErgonoptiX Comfort Loupes utilize extremely light weight materials. The ErgonoptiX Micro Galilean Loupes weigh as little as 30 grams (not including frame).